"I have a Kindle. I'm waiting to buy the iPad... But I prefer to read a book in hardcover. I can mark it, and it's on my bookshelf and I can refer to more easily." In support of Libraries, Books for Walls Project encourages you to donate used books, become a friend of your local library and/or hug a librarian (or at least thank them)... simple things that are guaranteed to make the world better. Find your local library at www.worldcat.org. P.S. We are working on getting Steve Job's email address to invite him to BFWP's --to show him that not only do people read, people LOVE to read! * And we'll formally introduce you to Tracey, very soon! For whatever reason one reads, one learns and appreciates life more. As joylynbarret said, reading is like breathing. Let’s raise our glasses to our freedom of being able to read; for the kindness of the librarian, and to the very goodness of a good book! Wow, can't wait to hear more. We read hundreds of books over here! There are bookshelves in every room, and books are part of the design scheme. We like to think of ourselves less as dinosaurs and more like literary dragons! by Elizabeth Barrett Browning of course! My, what to say, where to begin... first: how to thank ye originators of this project that so inspires on so many levels. Cheers & celebration to you all! My books are like old friends and parting with them is difficult. I have hand-me-down furniture, clothes that have been worn, recycled, torn, mended... but my books, so many of them I revisit every year... there are those for special occasions & re-reads; there are those; the passages of which I reflect on, remember and utilize when the moment is right... there are those that were my grandfather's that I cannot imagine letting go of. I do have an iPod but I always buy CD's. I do use email every single day (almost) but I make a point to send hand written letters and handmade cards regularly. 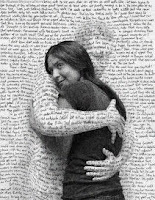 I appreciate the innovation of technology and dabble in the realm of social marketing every weekday... but books, like handshakes and hugs and smooches on each cheek can never, ever, never go away completely. Not ever!! Hi I am an emerging novelist. But the question I have is this. I love how your comments stay open all the time, instead of having to click on hidden comments. Could you tell me your secret? I also love how I can submit a comment in one click. Currently people have to go thru 3-4 clicks to leave a post on my blog. How did you do that? Thanks. BUT if you click on the web address specific to a post, for example, http://www.booksforwallsproject.org/2011/04/what-are-you-reading-right-now.html (our Challenge to share what you are reading right now!) the comments will be open and ready for a reader to start typing! As how many clicks to comment those changes can be made from your dashboard --Click on settings, then comments, and then edit settings to your liking!